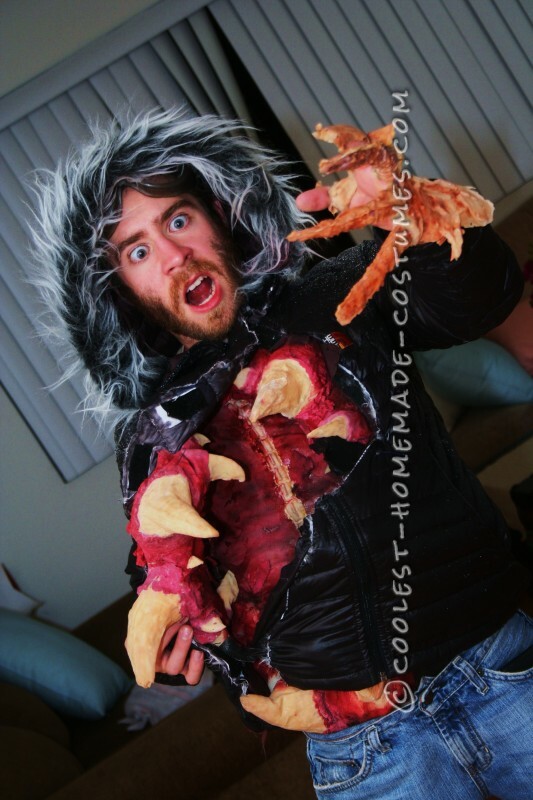 I had the idea to make a John Carpenter’s “The Thing”(’82)-inspired costume back in 2011. 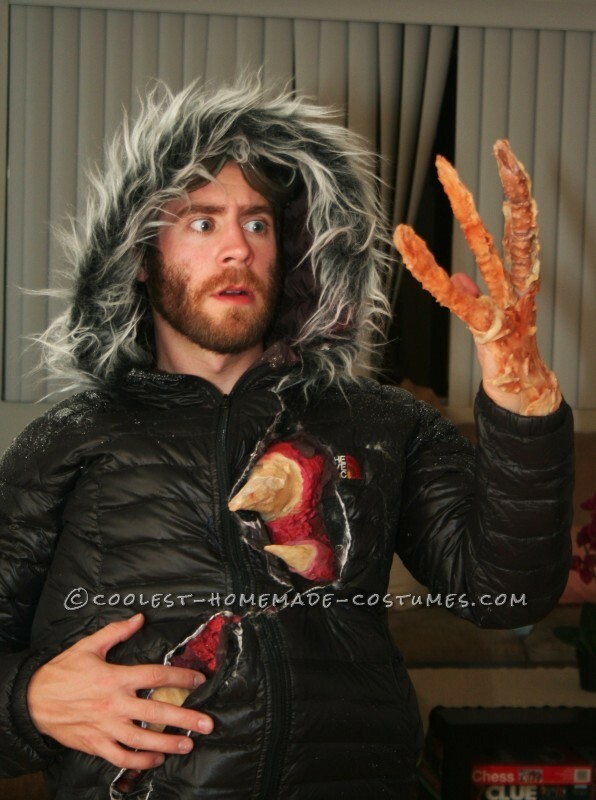 I went searching around the New England thrift stores for a parka-like jacket with a fur-lined hood, reminiscent of the one used in “The Thing” poster artwork. After much searching, I found one for a good price, and purchased it. The next step was to make the giant sharp teeth and Thing-fingers. I purchased a few king-crab legs, and sculpted 1 large tooth and 2 smaller teeth in clay, then made UltraCal molds of everything. Afterwards, I removed the clay and cast a number of latex duplicates of the teeth and Thing-fingers. Halloween was a few days away, and all I had left to do was assemble all the pieces. I cut the jacket open and found red fabric to sew inside. All the elements were ready for assembly, but, as it would turn out, no such fate would befall it. On October 29th 2011, nature brought its fury and unleashed record 20” of snowfall and record breaking winds. The “Halloween Nor’easter”, sometimes referred to as “Snowtober” and “Storm Alfred” knocked out power for approximately 1.7 million customers in the Northeast. My sewing machine was down, Halloween was cancelled, and the costume pieces went into a box. In August 2012, I packed my car and moved from CT to Los Angeles, but managed to bring the latex teeth along. Halloween approached rapidly as I was busy doing a myriad of other projects and trying to make a living in a new location. To my dismay, those parka-type jackets are not easy to find in such a warm climate as LA. Instead, for Halloween I went as a dead GI soldier with a re-purposed exposed-teeth latex makeup application (since I already had all the elements). I was worried the parka element would be the hardest to find. Luckily, I went back to CT for my cousin’s wedding in early October, and brought the other costume elements along to finish it up while I was there. Found a cheap, appropriate-looking coat with a hood, although I would have to sew a ‘fur’-lining onto it. Using liquid latex tinted with acrylic paints, various areas of the foam were then coated with a colored flexible ‘skin’, and the premade latex teeth appliances were attached around and over the foam teeth. 2 days before a Halloween party on the 26th, I cast a latex spine from an older repurposed mold and attached it inside the chest cavity. Also, since the hand was only fingers at that point, and I was in the process of making a mold for another costume, I sculpted a quick ThingHand that could easily stretch over my pinky and thumb, thus holding it in place over the back of my hand. 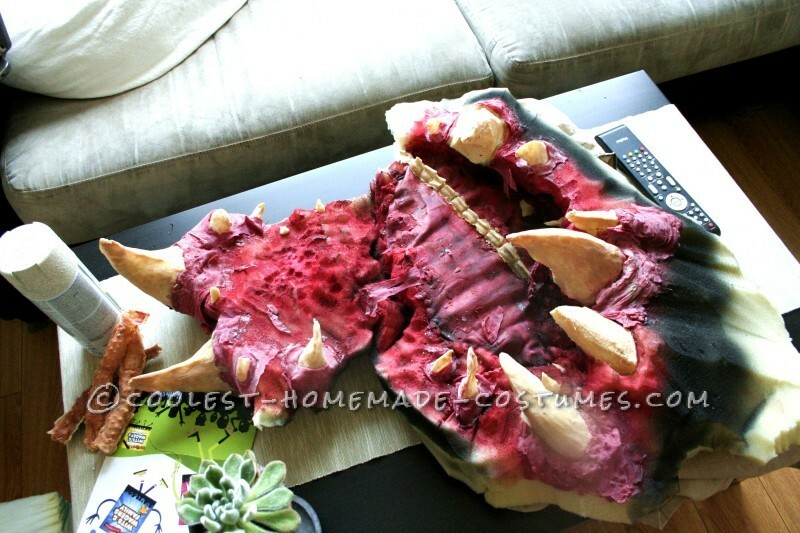 The whole shebang was then airbrushed with acrylic paints. A light dusting of textured spray paint on the jacket gave the frost/snow effect. On the night of the party, I painted the hand and fingers using an airbrush, and I sewed the foam mouth onto the inside of the jacket. 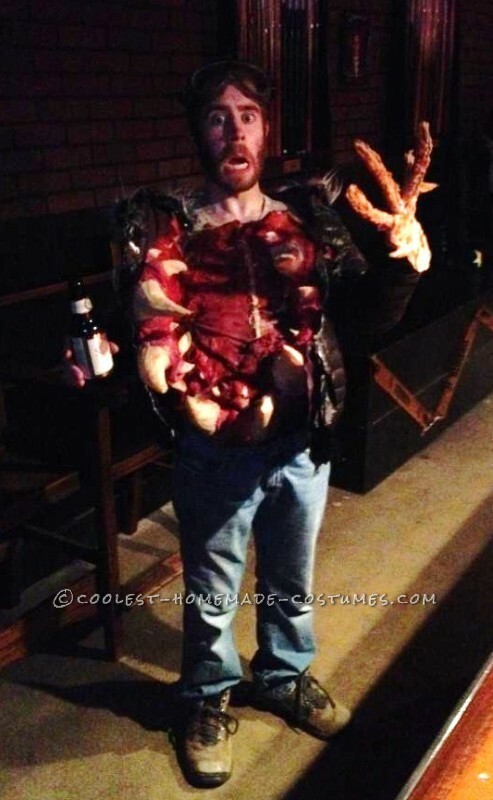 We hit up a few different parties, and although I did not expect many people to understand my costume, a surprising number of people yelled out “it’s the Thing!”, and so I proceeded to eat them. While the costume functioned to open up as a reveal of sorts, I generally left it open all night, allowing my ‘jaw’ to flap and ‘bite’ as I danced. I met a few new friends and had a grand time. All in all, a successful Halloween. I am extremely happy with how the costume came out, and the fact that people recognized this obscure reference to a favourite film of mine makes the extremely long post-ponment all the more rewarding.